PT Nindya Karya (Persero) - Nindya Karya is a well-established state-owned general construction services company in Indonesia with rapid business expansion. Established since 1961, Nindya Karya has core business competencies in construction, Engineering, Procurement and Construction/EPC and investment. PT Nindya Karya (Persero) is a state-owned company which is majority owned by PT Perusahaan Pengelola Aset (Persero) or known by PT PPA Group. As of December 2017, PT PPA - a reputable state-owned financial and asset management firm in Indonesia fully-owned by the Government of Indonesia - holds 99% shares in Nindya Karya. Other 1% remaining shares was owned by the Government of Indonesia. Based in Jakarta, Nindya Karya runs its business through 7 regions spread in all over Indonesia and 2 divisions; EPC and property. Nindya Karya also supported by 2 subsidiary/affiliated companies, namely PT Nindya Beton and PT Marga Kunciran Cengkareng. Its head office is located at Jl Letjend MT Haryono Kav 22 Jakarta 13630. Nindya Karya supported by 658 employees, including 273 permanent employees and 385 non permanent employees. In term of financial performance, Nindya Karya booked positive growth in 2017. According to information found in PT Nindya Karya (Persero) Annual Report 2017 as cited by JobsCDC.com, Nindya Karya registered total revenue of Rp 5.88 trillion in 2017. This number is up 26.18% from Rp 4.66 trillion in 2016. Referring to its annual report, total comprehensive income in 2017 amounted to Rp 504.54 billion as compared with Rp177.42 billion in 2016. Minimum 5 years of experience in the field of pump. Have experience in the field of oil and gas project. Familiar with international code and standard (API, NFPA, UL/FM). D3/S1 Civil Engineering, Structure Engineering. Minimum 8 years of experience in the field of civil design. Have experience in the field of project design structure for electricity power plants, oil and gas and petrochemical. D3/S1 Civil Engineering, Industrial Engineering, Mechanical Engineering. Minimum 2 years of experience in the field of cost controlling system. Have experience in the field of EPC project. Familiar with control budget and program monitoring. D3/S1 Electricity Engineering, Electrical Engineering. Minimum 3 years of experience in the field of instrumentation design. Have experience in the field of oil and gas and petrochemical projects. Minimum 3 years of experience in handling EPC contracts. Deep understanding of government regulations. D3/S1 in any field, preferably from Engineering. Minimum 1 year of experience in the field of sales/marketing, preferably in EPC projects. Strong communication skill and able to work in a team. Skilled in using Microsoft Office (Word, Excel and Power Point). Able to work under pressure and willing to work over time. JobsCDC.com now available on android device. Download now on Google Play here. Please be aware of recruitment fraud. The entire stage of this selection process is free of charge. 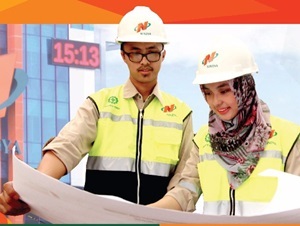 PT Nindya Karya (Persero) - D3, S1 Engineer, Officer EPC Project Nindya Karya March 2019 will never ask for fees or upfront payments for any purposes during the recruitment process such as transportation and accommodation.